I never even knew of the existence the orange-covered version of module B3, Palace of the Silver Princess until many years after the fact. Yet more years would pass before I ever set eyes upon it, thanks to the strange generosity of Wizards of the Coast. 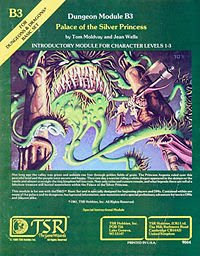 For me, the green-covered version depicted to the left was the only version of this classic 1981 module. Unlike many of the modules I have thus far included in my retrospectives, I would never argue that B3 is anything special. Indeed, unlike many old schoolers, I do not consider either version of Palace of the Silver Princess one of my favorite modules. The green version, for which Tom Moldvay claims cover credit for his revisions, is an early example of trying to add "story" to what would otherwise be a fairly straightforward site-based adventure. The original orange version looks a little too much like In Search of the Unknown, although that may in fact be a virtue I have yet to fully appreciate. Others have done a good job of amassing the details, such as we know them, surrounding why there are two versions of the module, so I won't be dwelling on them in this entry. Rather, I want to talk briefly about why, despite all its flaws, I still have a soft spot for B3. You see, Palace of the Silver Princess was the first module I played in which both my friend Mike's metalhead brother and his father were co-DMs. For my 12 year-old self, this was an impossibly cool moment. I've mentioned Mike's older brother before. He was a textbook example of a "killer DM" and took great pleasure in torturing our hapless characters in his intricately imagined deathdrap dungeons. Mike's Dad, on the other hand, was a wargamer; he had huge boxes of the kind normally used to sort screws, except his were filled with cardboard counters. He also painted miniatures, which made him even more cool to us kids. When Mike invited us over after dinner to play D&D with his brother and his father, we could hardly refuse. I don't actually remember many specific details from that evening. I am certain that Mike's many characters died in succession, at least once to green slime. I also remember quite clearly that these deaths were solely due to Mike's own foolhardiness, not any maliciousness on the part of our Dungeon Masters, who were scrupulous in their adjudication of the rules. They were the kinds of guys for whom the term "referee" was meant to be used. They were "tough but fair" and you know that, if you died, it was your own damned fault, or at least just bad luck. Neither Mike's brother or father went out of their way to kill our characters, even if they did sometimes take a certain amount of perverse glee out of our deaths. We never held it against them, of course; death was part of what it meant to play D&D and we accepted that. Getting a character to survive till 2nd level was an accomplishment and one we bore with pride. Palace of the Silver Princess is a largely nonsensical module. I am reluctant to call it a "funhouse," because its design lacks the whimsy I associate with such modules. In addition, there's just enough of a suggestion of a plot that I remember being left scratching my head as to why everything was arranged in the dungeon as it was. Had it just been purely irrational in design, I doubt I'd have exerted much effort in trying to figure it out its presumed "mysteries." I'm not sure that, to this day, I really know what B3 was supposed to be about. I dimly recall something about a curse by an evil wizard or somesuch. There's a vaguely Sleeping Beauty-esque quality to the thing, I suppose, but it's a bit vague and difficult to use to gain much insight into its design. Still, I had a lot of fun that night 27 years ago. Three "generations" of gamers gathered around a table that night -- an old school wargamer, a player of OD&D, and a bunch of kids who got into the hobby through Holmes. All of us sat around and played a module written for yet another iteration of the rules and we enjoyed ourselves in spite of the general weakness of the adventure. I won't go so far as to say that's my definition of gaming heaven, but it comes pretty close to it. If nothing else it gave us that groovy cover illustration of the decapus. Hmmm, if you assign each of the beholder's eyestalk attacks to one of the tentacles that would be pretty nasty. Fear...the begroper! I, believe it or not, was given this adventure as a present from my parents on Easter. They put this and another book IN the Easter basket. You know, while I find the module reviews pretty interesting, the only two I've ever owned were the two that came with the Moldvay B/X sets. I'm kind of curious as to how many people are as module poor as I am. I only recently started getting more of the original modules. Paizo offers PDFs downloads of many of them on their site. My biggest beef is that the some are poor scans--to the detriment of the artwork. Then again, for $5 you can't really go wrong. /I just checked and PotSP is available. I really love this module too, for nostalgic reasons & the fact the Artwork is excellent.At least eight seperate artists worked on the B3 module. I'm really fond of the map of the "land of the Princes of Glantri". It's very evocative to me. This was the first Dungeon my brother and I bought. We had played in a number of home made dungeons prior to buying Palace. This was the first dungeon I completed. Today I will be playing it again, this time as the DM. A new generation of players will test their blades against the hordes of chaos. Oh yeah...I am beefing it up to a level 10 dungeon. The Orks will become Ork Warlords and the Ogre an Ogre Mage, the Vampire roses and archer bushes will get x10 hit points and attacks that do 3x the damage. The Evil Cleric will be a level 12 cleric and the Werewolf am replacing with a level 10 Magic usser who is the girlfriend of the evil cleric. The Illusionary gaurds on the Gem will be level 8-12 warriors in +4 plate with +3 Flame Brands they will be real of course... All the various monsters in the dungeon will be properly beefed up and some traps added to tax the thief. This should be a fun game.